If you walk along one of the leafy roads from Hackney Downs and turn down a little side street, you may just find yourself at an old printworks. Now known as Hackney Down Studios, the space houses a collection of creative studios and workshops, including that of the London-born artist Paul Benney. Stepping in from the bright street to Benney’s equally well-lit studio, one is immediately struck by how dark many of his paintings are in comparison to their surroundings. Speaking in Tongues, which is to be exhibited at the 2017 Venice Art Biennale, along with Benney’s Reliquary series, is an excellent example of what the critic Adrian Dannat has called the ‘sombre richness of Benney’s aesthetic’, and several of the works in his studio resonate with an intense, inky darkness. Before Benney arrives for our meeting, his studio manager shows me Benney’s particularly dark series of mirror paintings. Displayed in oval white frames, the paintings appear to be almost completely black. As one moves closer, however, pale faces can be seen behind the darkness; an ever-so-slightly pulsating light above the works increases the sense of eeriness that emanates from the works. When Benney does arrive, dressed comfortably in a black shirt and trousers, he recounts how gallery-goers are often confused by the paintings, half-believing that there is somebody on the other side of the canvas. This unsettling feeling of not knowing which is more real – the self or the reflection – is something that has interested Benney since childhood. As a teenager, he explains, he was fascinated by the experience of staring closely into a mirror, getting closer and closer to the surface ‘until you weren’t quite sure who was looking at who’. I mention Sylvia Plath’s poem ‘Mirror’, which seems to resonate with the images before us: ‘I am silver and exact. I have no preconceptions. / Whatever I see I swallow immediately / Just as it is, unmisted by love or dislike’. The poem ends unnervingly: ‘In me she has drowned a young girl, and in me an old woman / Rises towards her day after day, like a terrible fish’. Benney’s paintings have a similar feeling of something drowned or suspended within them – like insects embedded in amber – and are acutely haunting. It later transpires that Benney spent some time living and working in a disused abattoir, and later in a former morgue, and I wonder if this has somehow fed into aspects of his work. Benney’s art, he hopes, strikes the part of the mind that exists subconsciously, perhaps accounting for its sense of mystery. He speaks about how feelings exist before we verbalise them, or voice them to ourselves, and it is these feelings that his work seeks to represent. When we look at his paintings, then, it is our ‘ancient brain, an animal brain’ that is engaged, although Benney notes, chuckling, that this appeal to the ‘wordless brain’ can make it difficult to talk about his work. 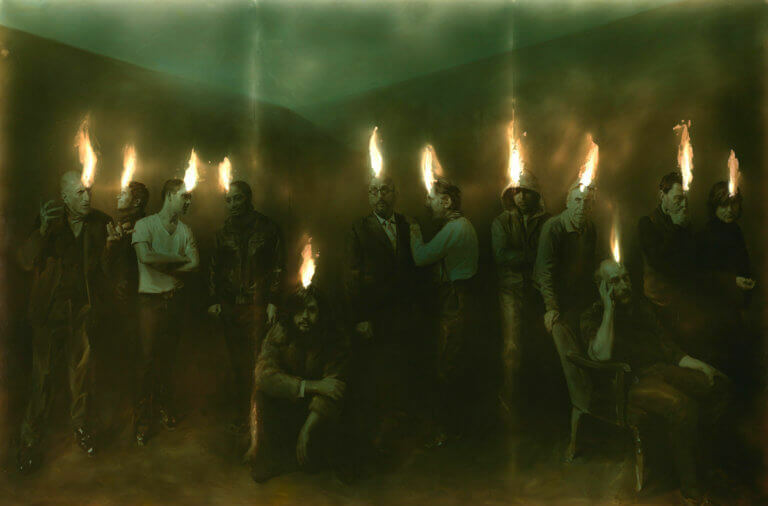 One work that I am particularly keen to talk about nonetheless is Speaking in Tongues, the twelve foot by eight foot painting based on the story of the Pentecost in the New Testament, when the disciples are visited by the Holy Spirit and begin ‘speaking in tongues’. Interestingly, the work comes from a secular standpoint: Benney is not religious, although he was brought up in a Church of England context. Instead, the painting shows twelve friends of Benney’s, loosely representing the apostles, who stand and sit in various manners and poses. Each man has a bolt of fire emanating from his head, so that each seems alight with spiritual awakening. These flames are the brightest part of the work, the muted tones of which deliberately recall Goya’s Lunatics in the Yard (1794), and the work has an additional and unexpected sound element to it. Benney’s friends were recorded speaking about revelatory moments in their lives – births, deaths, betrayals, hopes – and their stories are relayed through holosonic speakers placed around the painting. The overall effect is of a low murmuring, a sort of spiritual chatter, although if viewers stand in a particular spot, sound-focusing technology allows them to hear individual voices with clarity. Benney worried that this extra element might distract from the visual impact of the painting, functioning as a superfluous ‘bolt-on’, but has come to see it as integral to the work’s engagement with contemporary spirituality. So far, the work has been seen by an estimated 40,000 people at Chichester Cathedral, with a variety of reactions: ‘some people were very moved by it, others were mystified’. Benney has come under fire for not including women in his re-imagining of the Pentecost, but he argues that he is being true to the representation of the disciples in the Bible, all of whom were male. Benney is animated by the prospect of exhibiting at the Venice Biennale, one of the pre-eminent contemporary art exhibitions in the world, and enthuses about having two shows there at once. His Reliquary series will be displayed on either side of Speaking in Tongues, so that the church will be full of painted flames. Reliquary is a suite of six small canvasses, each depicting the type of candle used in votive offerings in the Christian church. The candle has been covered with a bell jar, and, unsettlingly, continues to burn. We see it decrease in size in each painting, until the last canvas shows the bell jar filled with smoke from its extinguished wick. Light plays such a strong role in Benney’s painting that I ask him how he feels about artists such as Hockney or Hodgkin, who respond to light and colour in such different ways to his own. Benney praises the illuminating quality of Hodgkin’s work, noting that it can considerably brighten the dull, grey days of London, and acknowledges some of Hockney’s earlier work as an influence (he is less keen on the artist’s more recent output). It is to Goya’s traditional technique of chiaroscuro – the tonal contrasts between light and dark – that Benney is most indebted, however. For now, both Speaking in Tongues and Reliquary remain in London, ready to be transported to Venice in due course. Benney is a Londoner by birth and location, and he has spent the past three years in his current studio in East London. Prior to this, he was Artist in Residence at Somerset House for five years, and he has also lived in parts of West London. Being born in the city, he says, ‘allowed me to come back, in some way, because something deep within me was comfortable with city life, and specifically London’. His brothers and sisters, he notes, do not have the same attachment and were born elsewhere. Has London changed in the time that he’s known it as an artist? I know the answer to this before it comes, and Benney speaks about the inevitable process of gentrification that happens when artists breathe life into hitherto ‘no-go’ areas of town: ‘I’m sort of sick of it now, as I feel like I’m doing the job that developpers benefit from’. A similar thing happened when he lived in Manhatten, in an area where ‘you couldn’t pay people to visit you’. Illuminatingly, Benney sees the artist’s creative role as enacting a similar process. ‘You have to be prepared to go to places that other people don’t want to, or don’t dare to, and that can be an emotional place, a spiritual place, a psychological place, a philosophical place. And you’ve got to peer over the edge of that abyss, and come back’. Paul Benney will be exhibiting Speaking in Tongues, along with his Reliquary series, at the Chiesa di San Gallo, San Marco 30124, Venice, 13 May – 26 November 2017. More information on Paul’s work is available here.